The Venture Heat Shoulder Wrap provides all-natural pain relief with far infrared ray deep-tissue heating. An afflicting shoulder is common among athletes, the elderly, and those involved in automotive accidents. To help ease the discomfort, our Rechargeable Heat Therapy Shoulder Wrap safely provides deep penetrating Far Infrared Rays (FIR) directly to the source of the pain. Take action now with a safe alternative to potentially harmful medications with the ultra-portable heated shoulder wrap to start experiencing relief today. As the pioneer of portable Far Infrared Heat Therapy, +Venture provides therapeutic heat with a safe, low voltage heating system so that you are able to experience instant pain relief no matter where you are. • Melts away muscle tension and fatigue. (1) Charger Deep Penetrating Therapeutic Heat:Unlike conventional forms of heat therapy products, which heat up only the surface of the skin, Far Infrared Ray heat penetrates up to 3 inches into the muscles and bones, optimizing its therapeutic benefits. In addition, FIRs superior heating efficiency enables users to use a lower overall heating temperature, perfect for sensitive individuals. 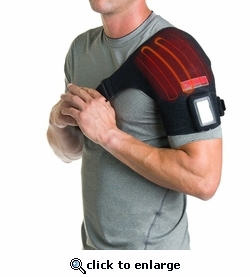 The Venture Heat Shoulder Wrap provides all-natural pain relief with far infrared ray deep-tissue heating. An afflicting shoulder is common among athletes, the elderly, and those involved in automotive accidents. To help ease the discomfort, our Rechargeable Heat Therapy Shoulder Wrap safely provides deep penetrating Far Infrared Rays (FIR) directly to the source of the pain. Take action now with a safe alternative to potentially harmful medications with the ultra-portable heated shoulder wrap to start experiencing relief today. As the pioneer of portable Far Infrared Heat Therapy, +Venture provides therapeutic heat with a safe, low voltage heating system so that you are able to experience instant pain relief no matter where you are. Deep Penetrating Therapeutic Heat:Unlike conventional forms of heat therapy products, which heat up only the surface of the skin, Far Infrared Ray heat penetrates up to 3 inches into the muscles and bones, optimizing its therapeutic benefits. In addition, FIRs superior heating efficiency enables users to use a lower overall heating temperature, perfect for sensitive individuals. With the temperature controller built into the slim battery, you can have heat on demand and select between 4 different heat settings with the touch of a button to suit your individual needs. Unlike conventional forms of heat therapy products, which heat up only the surface of the skin, Far Infrared Ray heat penetrates up to 3 inches into the muscles and bones, optimizing its therapeutic benefits. In addition, FIRs superior heating efficiency enables users to use a lower overall heating temperature, perfect for sensitive individuals.